Giving players the chance to enjoy the excitement and the potential rewards of a bank heist without any of the jeopardy or danger, SafeCracker is a fun and traditional Vegas style slot game. That means that the slot features just the three reels and one payline, but where that would be the end of the story with many such games, SafeCracker does also introduce a fun and potentially really beneficial bonus game. 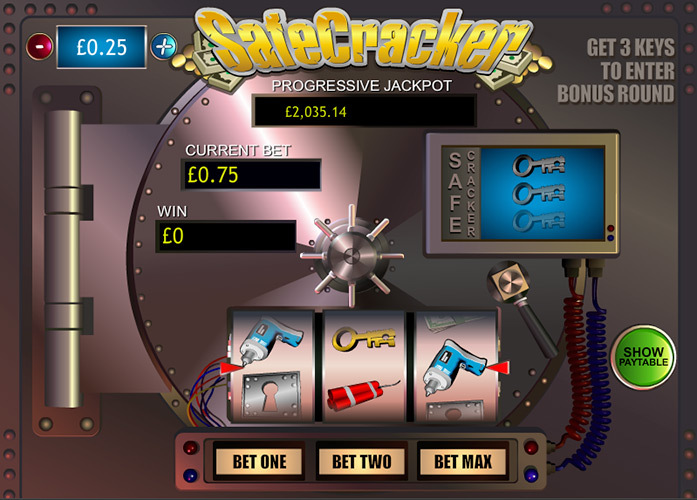 SafeCracker is linked to a progressive jackpot that can see players achieve huge payouts. Payline jackpots aside from that progressive jackpot are also really impressive and compare very favourably with those of other similar games. A bonus game introduces some extra fun to gameplay and another way for players to win big. Aside from the bonus game, gameplay is a little repetitive and simplistic. The range of available staking options per spin is comparatively limited. A maximum possible bet per spin of just £15 is likely to put off higher rollers. It is in the area of its jackpots that SafeCracker really excels as a slot game option. The traditional Vegas style slot, after all, offers the chance not only to win a massive progressive jackpot but also boasts a range of impressive payline payouts below that, too. The progressive jackpot linked to the game is available only to those players betting the maximum amount per spin, and results when three CASH symbols appear consecutively on the reels. At the second highest (of three) bet levels, meanwhile, the same combination pays out at a rate of 4000 times the player’s bet. That means that at the top available coin value of £5, the payout would be worth £40,000. As we’ve already discussed, SafeCracker is a traditional Vegas style three reel slot which means it does not include wild or scatter symbols. 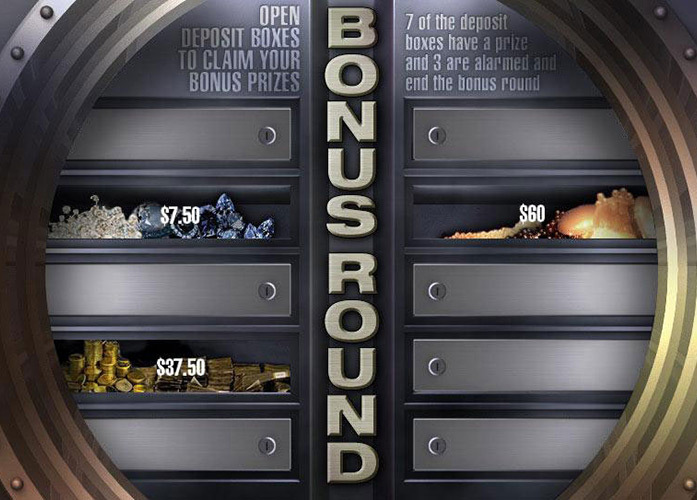 Unlike other games of its type, however, the slot does include a fun bonus game. The SafeCracker slot’s reels are populated by a number of money and safe breaking themed symbols, and it is the key symbol which triggers a bonus game if three of them appear at once. That bonus game asks players to select from a choice of ten different boxes. Seven of those boxes contain instant cash prizes, whilst the other three put an immediate end to the bonus game. It pays, therefore, to pick carefully. All of the SafeCracker symbols are in some way related to the task of trying to crack a safe or the rewards you may get from doing so. As we’ve already mentioned, it is the Cash symbols which deliver the highest payouts but there are some handily generous winning combinations to be made from other symbols too. The slot’s dynamite symbol, for instance, delivers payouts worth 300, 200 and 100 times a player’s bet at the top, middle and bottom betting levels respectively, when three appear at once. A combination of three drill symbols, meanwhile, results in corresponding jackpots of 225, 150 and 75 times the bet. As a traditional three reel slot, SafeCracker always has just the one active payline and as such allows players to adjust their betting amount simply by setting the number of coins to bet per spin and how much those coins are worth. Bet levels of one, two or three coins can be selected from and those coins can be worth between 1p and £5. What that means, therefore, is that the lowest possible bet per spin is just 1p and the highest possible is a far larger £15. If your opinion when it comes to slot games is that if it’s not broke you shouldn’t fix it, SafeCracker is sure to be right up your street. It is, after all, a very traditional and simple three reel slot in the instantly recognisable Vegas style. What’s more, its simplicity is then twinned with outstanding generosity, in that the game offers the chance to win a potentially gargantuan progressive jackpot or impressively large payline jackpots beneath that. A bonus game, too, is featured in SafeCracker to make it a little more interesting than many traditional slots and to introduce yet another way to win. When all’s said and done, however, SafeCracker’s gameplay is mighty repetitive and the slot also offers a comparatively restrictive range of staking options. This game has a rating of 3 / 5 with 287 total reviews by the users.